Mary’s Flanging Effect or Timeless Pop for Now People | This is Water. This is Water. Mary’s Facebook page claims Gene Clark and the Zombies among others as influences and you can hear those timeless sounds in her music; yet it’s not a lazy trip down nostalgia lane. 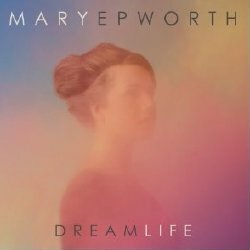 Mrs. Epworth takes those classic pop tropes and imbues them with a modern life backbeat that achieves the all too rare creation of a record that is both timeless and of this time. When I listen to Black Doe I stumble for meaningless phrases like Appalachian Industrial and then I hear Long Gone and I hear a tune straight outta a Grant Lee Buffalo cover of a long lost Vanilla Fudge song with a chorus that tickles my pop heartbreak angst in all the right places. In other words this is one of those rare records that defy description but I’ll call it flanging fantastic. For the curious Flanging is an audio effect where two identical signals are played simultaneously but one of these signals is delayed causing a sweeping sound much like Mary’s music takes a timeless pop sound and counterpoints it along a current here and now sensibility that resonates with the listener far deeper than any trip down memory lane. I bring up flanging because many of the songs that I hear on Dream life remind me of those classic tunes that utilized the Flanger to such great effect like Tomorrow Never Knows, Uncle Albert/Admiral Halsey, an entire Bowie album and a few dozen classic Beach Boy tunes just to name a few. You get the picture. And just in case you don’t, Dream Life should share a shelve comfortably with those records. Ok so what I really mean is; get this record if you care about great music and timeless pop and still believe these things can change your life. I may call it Mary’s Flanging effect but you should just get thee to the digital distro of your choice and (legally) download this record. Your soul will thank me.